Cleverly named for it's close, but not too close, proximity to Cape Canaveral Space Center, Satellite Beach claims the widest area of the barrier island, in Brevard County, Florida. The town lay just south of Patrick Air Force Base, where many of the residents work, and is easily accessible from the mainland using the Pineda Causeway. Fully developed to accommodate the base, there are a multitude of homes to choose from in this small beach side village. 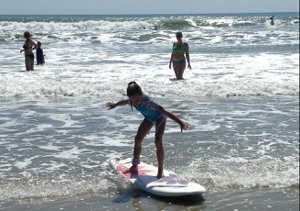 You'll find a well defined city limits on the north, as Patrick AFB encompasses both sides of route A1A, leaving a long stretch of lightly developed, and scenic ocean side drive, to Cocoa Beach. Viera, Florida awaits any Satellite Beach residents who venture to the mainland. Here you can find many upscale shopping and mega stores that aren't quite so common on the beach side. 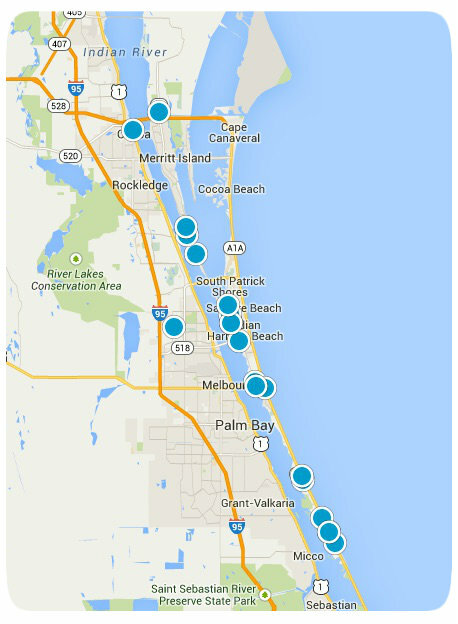 Many of the vital county government facilities are locating to Viera, which is quite convenient to Satellite Beach locals. Don't deduct that Satellite Beach has nothing to offer, because regardless of it's size, there are many attractions in this area of the island that aren't found in neighboring towns. The barrier island's only traditional synagogue, Chabad of the Space and Treasure Coast, is located on A1A. You'll also be able to go to the movies at the Satellite Beach Cinemas. There is a High School, shopping plazas, restaurants, and everything else you could want in your home town. Particularly well planned is the area around the library on Jamaica Drive, a large area of land with numerous activities for residents. There is a skateboard park, dog park, and ball fields, as well as open space and jogging paths. Lansing Island, along with Tortoise Island, are gated communities which possess almost all of the river front in Satellite Beach. These homes offer added privacy from the outside world, and offer breathtaking views of the river and nearby wildlife areas. There are plenty of river accessible homes along the canals that lace the west side of the island in Satellite Beach. All have docks which allow boats to be ready to launch at will. Sailors, canoeists, kayakers, and any other non-motorized vessels can enjoy the solitude of no motor powered boats, being allowed in the large buffer zone around Patrick AFB. If living ocean front is your preference, then Satellite Beach offers a long stretch of beach with many mid-rise condos, beach houses, quads and duplexes in every size and shape. Walk out on the beach from your home here, and you may spot a Right whale in the ocean; these whales calve off of the city's coastline and are making a comeback from near extinction. They were popular to hunt in past centuries because of their docile nature. Coquina rock beds can be seen during low tides, and create a natural barrier to beach erosion. These large beds of rock also offer habitation from many species of fish and aquatic life. Don't forget about the fantastic spectacle of a rocket being launched from NASA. You'll have a front row seat on your ocean front balcony!